Consumer electronics are among the most popular items purchased on eBay. According to some, eBay is a source of lucrative electronics deals while, according to others, electronics purchases on eBay are fraught with fraudulent practices and not worth the risk. In fact, both can be true, depending on how you search for items and from which seller you ultimately decide to buy. Here are some tips that can help to ensure a successful eBay electronics shopping experience. Despite evaluation-oriented features such as eBay reviews and guides, eBay is not a particularly good place to learn about the types of items you might want to buy. A better place to conduct your research is a local electronics store, for example, or consumer electronics magazines and websites. Not knowing what make, model or features you want in a consumer electronics item is a surefire way to have a poor buying experience on eBay. You should also research the price range of any product so that you can spot a too-good-to-be-true deal. Having price ranges in mind is also helpful in narrowing your search because searches for consumer electronics items can quickly become overwhelming. eBay provides advanced search tools that are helpful when you are searching for specific items. A generic search for a “plasma tv” or “iPhone” will yield an overwhelming barrage of items. Use multiple and exclusive keywords to search more specifically for only the features, specifications, make, or model that you want. Survey eBay’s custom search options to see if you can refine your search even more by price, location, or other auction details. Include search terms that describe specifications that are important to you—for example, not just “iPhone” but “new gold iPhone 7,” not just “plasma tv” but “used 26-inch Sony plasma tv.” Consider also using eBay’s product finders for the type of item you want to buy for the most specific possible set of results. Use the auction watching features on eBay to bookmark a few (at most, five to 10) auctions from different sellers that fit the bill for you. This will give you have a manageable number of options. Only watch those that are really what you are looking for in terms of the manufacturer, the make, the right selling conditions, the right auction terms and details, and the right price range. Be careful about the items on which you choose to bid and the seller(s) with whom you choose to transact. Search the web for tips on purchasing your specific item once you've found a selection of items you're interested in and search for reviews on the sellers. Once you have a list of five to 10 items that meet your requirements and price range, you’ll need to actually decide where to place your bid. 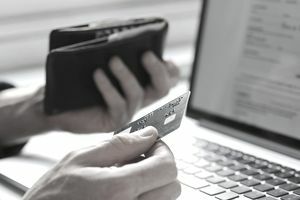 More often than not, this comes down to balancing your need to get the best price against your equally important need to buy from a reputable, conscientious seller. Here’s how to choose. Don’t select the lowest priced item. This is a common mistake made by eBay beginners and one of the biggest mistakes you can make. Read each of the item listings in question carefully to extract as much information as you can. Give more weight to sellers who describe the item’s condition in detail (“new in box,” or “used but functional with some scratches”) than to sellers who do not describe the product's condition. Read the warranty, return, and shipping policies carefully to see how complicated things will be in each case if you receive a defective or unsatisfactory item. Check the seller’s feedback. Checking the feedback of each of the sellers in question is perhaps the most important step in deciding which auction to bid on or which item to purchase. As a general rule, never buy from any electronics seller whose feedback isn’t above 97 percent and give strong preference to sellers over 99 percent. Read the feedback comments from other buyers and watch for complaints related to shipping practices, item quality, or anything else that raises a red flag. Consumer electronics items are high-value items; it pays to be extra-careful with your seller selection since any loss may be large. Don’t bid on auctions with obvious warning signs. Check each listing carefully for anything that indicates that there may be something wrong with the listing or seller or that indicates that the listing in question may be fraudulent. Keep in mind the adage that “if it seems to good to be true, it probably is,” and avoid buying anything expensive from a seller that is outside your home country. Even if you receive a working item under such circumstances, most consumer electronics manufacturers will refuse to honor any manufacturer’s warranty for items bought outside the market to which they were originally exported. Buy from credit card-friendly sellers and be careful about shipping. Because of the high value and typical fragility of consumer electronics items, completing the transaction is more risky and complicated compared to other types of items commonly bought and sold on eBay. Avoid sellers who don’t accept PayPal or give you some other method of payment other than a credit card because credit card purchases are typically protected by the card issuer. Be sure that your seller is willing to pack the item well and offers a delivery method and tracking that you can work with. You don't want $3,500-worth of consumer electronics sitting on your doorstep for seven hours. Contact your credit card issuer and the shipper in question if the item arrives damaged or fails to arrive when expected. eBay, credit card issuers, and shippers all impose limits on the amount of time that you have to lodge any complaint that you may have, so your ability to seek recourse in the event of any problems is limited to a short period following the sale.